NYC, 05/11/2019, 2:00PM. Documentary: Dread Beat an' Blood (1978): Portrait Of A Black Poet And Activist. A portrait of Black poet and political activist, Linton Kwesi Johnson. 45 min. Director: Franco Rosso. 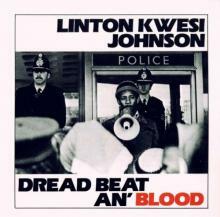 Johnson's poems, written in Jamaican creole, are chanted to reggae beat and reveal his feelings on racism and urban life in the Black working-class community of Brixton, London.